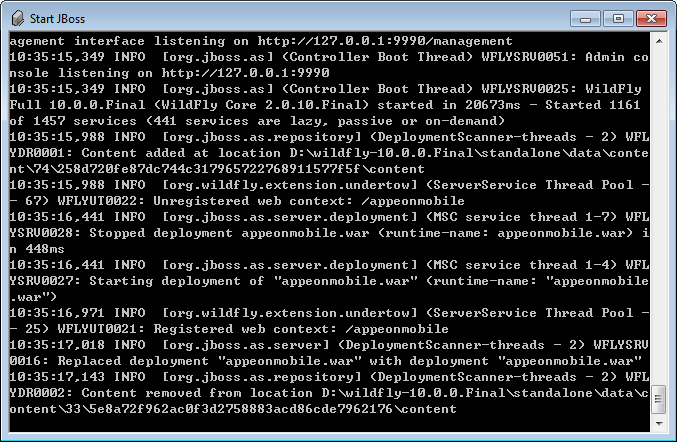 Change to the $appeon/bin/ folder, for example, /export/home/wildfly-10.0.0.Final/appeon/bin/ and run the appeonserverstart.sh file. The JAVA_HOME system environment variable includes the JDK home directory, for example, /usr/Java/jdk1.8.0_60 or /usr/Java/jdk1.6.0_24. The CLASSPATH system environment variable includes the JDK lib directory and the tools.jar file, for example, .:$JAVA_HOME/lib:$JAVA_HOME/lib/tools.jar. Note that values are separated with colon (":") and the period (".") indicates the current directory. The Path system environment variable includes the JDK bin directory, for example, $JAVA_HOME/bin.